This dispatch contains a number of items, all connected to Iran. It was written and finished yesterday morning but because of computer problems could only be posted today. Iran’s government-controlled Press TV has taken seriously a joke article published in Dawn, Pakistan’s biggest English language paper, “revealing” that Malala Yousafzai, the child campaigner for girls’ and women’s rights in Pakistan and elsewhere (see my dispatch last week) is really a Caucasian, most probably from Poland. * Malala’s shooting was staged by Pakistani and U.S. intelligence agencies to pave the way for the Pakistani army’s invasion of North Waziristan. * According to the spoof article in Dawn, Malala’s father told her doctor that Malala’s real name was Jane and she was born in Hungary in 1997 to Polish parents who were Christian missionaries. After traveling to the Swat Valley in Pakistan in 2002, they left Malala as a gift for her adopted parents after the whole adopted family had secretly converted to Christianity. Tom Gross adds: What is disturbing is that quite a high number of journalists among the liberal elites that dominate European media take Press TV seriously as a news source. The Israel Air Force has conducted special long-range flight exercises in recent days, both to keep in practice and as a reminder of Israel’s long-range capabilities. Tom Gross adds: The strike capabilities of Israel’s air force remain a closely guarded secret, but according to reliable reports, Israel has over 100 F15i and F16i fighter jets that can fly to Iran and return without the need to refuel, in addition to other jets (of the kind shown in the video above), with highly advanced midair refueling capabilities that would allow them to strike multiple Iranian targets. No one I know of in Israel seeks war, and everyone there is hoping that the Iranian regime will abandon its nuclear program, but so far there is no evidence it will do so, despite wishful thinking by certain eager Western journalists. 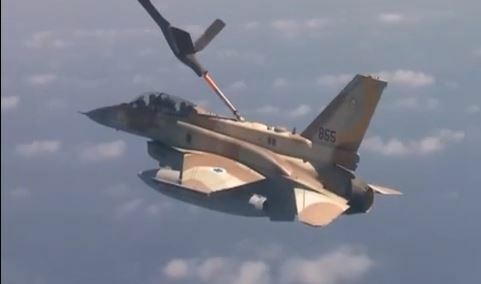 The Israeli midair refueling and dogfight exercises in recent days were carried out over Greek waters, with the permission of Greece, which in recent years has sought increasingly close ties with Israel as Turkey distances itself from the Jewish state. Last year, according to a new report by Amnesty International published last week, Iran executed 560 people – the second highest number of executions of any country in the world after China (which, of course, has a much bigger population). Public executions have become so common that children have started to mimic the executions as part of a game, and last month 12-year-old Mehran placed a noose around his neck and hanged himself accidentally with the help of his younger brother, in the province of Kermanshah in western Iran. Mokhtar Khandani, a journalist for the Mokrian News Agency, said the boy died as part of a game inspired by real hangings he had seen. Mehran threw a rope over a lamppost, stood on a cart and slipped the noose around his neck to allow his 8-year-old brother to pull the cart away. Mohammad Jafari Sahraroudi, who is the main suspect in the assassination of several members of the Iranian Kurdish democratic leadership in Vienna in 1989, last week was allowed free entry with an Iranian delegation that was taking part in a meeting of the Interparliamentary Union in Geneva, Switzerland. After that he travelled on to Croatia, which is now a member of the European Union. As part of its “charm offensive” to fool westerners while it continues to enrich uranium 24/7, the Iranian regime has reportedly canceled an anti-Semitic event held annually in Tehran. The country’s Foreign Ministry said the “New Horizon Conference,” scheduled for November, has been postponed. Held annually since 2005, the conference has hosted many prominent Holocaust deniers, including Americans David Duke, and Mark Weber who last year delivered a viciously anti-Semitic lecture on “The Zionist Lobby in America” to several hundred enthusiastic Iranian students. Iran has more enriched uranium than it needs for its research [TG: i.e. towards a bomb] and would be willing to discuss the “surplus” with Western powers during nuclear talks this week, the Speaker of the Iranian Parliament Ali Larijani told the Associated Press in an interview. “We have some surplus, you know, the amount that we don’t need. But over that we can have some discussions,” he said in Farsi, through his English translator. A key concession sought by Western powers in negotiations is for Iran to stop enriching uranium to 20 percent. The talks on Iran’s nuclear program are being held again this week with the five permanent U.N. Security Council members – the U.S., Russia, China, Britain, France – plus Germany, collectively known as the P5+1. The U.S. and its allies want Tehran to stop enriching uranium to 20 percent, a grade that is only a technical step away from the level used to arm nuclear warheads. It then wants the 20-percent stockpile transferred out of the country. The group also demands that Iran agree to shut down its bomb-resistant underground bunker known as Fordo, where it is enriching uranium to 20 percent, before discussing sanctions relief on Iranian oil and financial transactions. The BBC says that members of Iran’s parliament have denied reports that the country has a surplus of enriched uranium, but the Associated Press said they had a recording of the interview with Larijani and stood by the accuracy of their reports. Prior to the start of yesterday’s talks, Israel’s security cabinet took the unusual step of releasing a public statement, which affirmed Israel’s support for a diplomatic solution to Iran’s nuclear development, should Tehran comply with four measures: cease all nuclear enrichment, remove all stockpiles of enriched uranium, dismantle the Qom and Natanz facilities and stop work at the Arak heavy water reactor. Israel fears a partial agreement which will give Iran sufficient sanctions relief to move forward, but leave it in control of the key facilities which provide it with nuclear breakout capacity. The full statement is at the end of this dispatch, for those interested. Since the election of Iranian President Hassan Rouhani, his brother, Hossein Fereydoun, has become of his closest advisers. He has accompanied the president to many of his meetings, including his trip to the UN General Assembly in New York last month, and also took part in the meeting of the foreign ministers of Iran, the Five plus One Group and the United States, which was held in the margins of the UN. Fereydoun does not hold any formal position in the government. Fereydoun is President Rouhani’s younger brother and, unlike the president, did not change his surname from Fereydoun to Rouhani. In his memoirs, Hassan Rouhani related that his brother worked alongside him in the struggle against the Shah before the Islamic revolution. When Ayatollah Ruhollah Khomeini, the founder of the Islamic revolution, returned to Iran from exile in Paris in February 1979, Fereydoun was a member of Khomeini’s security team and was responsible for maintaining order and managing the ceremonies as the leader of the revolution made his way from the airport in Tehran to Behesht Zahra Cemetery south of Tehran. In the early days after the revolution he was responsible for the detention of political prisoners and members of the Shah’s Organization of Intelligence and National Security, the SAVAK, who were incarcerated immediately after the revolution (khordadnews.ir/news/4196). After Rouhani was elected president, exiled Iranian journalist, blogger and cartoonist Nikahang Kowsar published a posting on his blog claiming that according to “a security source” who held a position in Iran’s defense establishment in the 1980s, Hossein Fereydoun abused his position at the time, sexually harassing women who worked with him. This report was allegedly confirmed by another person who worked with Fereydoun. After a number of readers complained last week about a piece by Robert Fisk, the Chief Middle East Correspondent for the British paper The Independent, in which Fisk falsely claimed that Israeli Prime Minister Benjamin Netanyahu had called Iranian President Hassan Rouhani an “anti-Semite,” The Independent admitted that Netanyahu had never said any such thing. Fisk has often been accused of making things up to slur Israel and indeed in the 1980s was forced out of his previous position as Middle East Correspondent for The Times of London for doing so. In spite of this, Fisk holds more British and International Journalism awards than any other foreign correspondent. His fellow British journalists have voted him “International Journalist of the Year” on seven occasions. It has been revealed that three passengers were caught in early September with forged Israeli passports, which they attempted to use at Brussels airport in Belgium. The three forged passports had the word “Tel Aviv” in Hebrew in the wrong place on the passport. One of the passengers is an Iranian, and is thought to have posed a threat to Israeli security. The other two, who have not been named, are thought to be East European. The three were attempting to fly to Canada, with the Iranian planning to travel to Toronto and the others to Montreal. The fraud is being investigated by the Belgian and Israeli authorities. This is not the first time forged Israeli passports have been caught. In July, for example, seven Iranians tried to enter Vancouver, Canada with forged Israeli passports. A court in Azerbaijan on Friday sentenced Iranian citizen Bahram Feyzi to 15 years in jail for plotting an attack on the Israeli embassy in Baku. Feyzi, who was also found guilty of espionage, was accused of being an agent of the secret service of Iran. Azerbaijani officials have linked Iran to a plot to stage a wave of attacks on a number of targets during the Eurovision song contest held in the mainly Muslim (but unlike other Muslim countries) officially secular country in May 2012. At least seven people have been sentenced to lengthy jail terms in connection with the alleged plot while 29 more are currently facing trial. Azerbaijan enjoys close relations with the United States and Israel. Zahra Eshraghi, one of the privileged few in Iran with access to social media, told news website Asharq Al-Awsat she would like to see the Iranian regime ease its crackdown on the dress code. All Iranian women are expected to cover their bodies and hair, but not their faces. “The entire dress code law must be annulled,” she said. “My grandfather always said that the color black is not a good color to wear. That’s why I attribute my own dress sense to my family background. I even planned to issue a call to Iranian women via Facebook to begin dressing in happier colors,” she said. I attach one item below. Today, another round of negotiations between the P5+1 and Iran will begin in Geneva. Sanctions must not be eased when they are so close to achieving their intended purpose. Iran has been working for over 20 years to obtain nuclear weapons capabilities despite its declared commitment to pursue only civilian nuclear energy. During this time, Iran has repeatedly deceived the international community about its nuclear program, including its efforts to conceal enrichment facilities at Natanz and Qom. Iran has also systematically defied United Nations Security Council resolutions which call upon it to end its enrichment. Brazenly violating these resolutions, Iran has increased the number of centrifuges from 164 in 2006 to over 18,000 today, and it has amassed during negotiations with the international community several tons of enriched uranium. An Iran with military nuclear capabilities would threaten world peace and stability as well as the security of countries across the Middle East, including Israel, which it threatens to annihilate. Iran continues to develop missiles of various ranges, including intercontinental ballistic missiles designed to carry nuclear warheads. These missiles pose a threat to the Middle East, Europe, the United States and other countries. 1. Fully and sustainably suspend all enrichment, reprocessing and heavy water-related activity. 2. Refrain from any activity related to developing ballistic missiles capable of delivering nuclear weapons. In the resolution, the Security Council determined that Iran had breached previous UNSC resolutions. Over the years, the international community has imposed on Iran sanctions to compel it to end its military nuclear program. However, Iran continues to blatantly violate Security Council resolutions and to advance its military nuclear program, even as it negotiates with the P5+1. Today, another round of negotiations between the P5+1 and Iran will begin in Geneva. These negotiations begin at a time when the Iranian regime is under great pressure because of the sanctions and is desperately trying to have them removed. Sanctions must not be eased when they are so close to achieving their intended purpose. Now is an opportune moment to reach a genuine diplomatic solution that peacefully ends Iran’s nuclear weapons program. However, this opportunity can be realized only if the international community continues to put pressure on Iran and does not ease the sanctions prematurely. It would be an historic mistake not to take full advantage of the sanctions, by making concessions before ensuring the dismantling of Iran’s nuclear weapons program. * Cease all nuclear enrichment. * Remove from its territory all the stockpiles of enriched uranium. * Dismantle the underground facilities near Qom and Natanz, including the centrifuges inside them. * Stop all work on the plutonium-producing heavy water reactor in Arak. “A country that can enrich uranium to about 3.5% will also have the capability to enrich to 90%... Having fuel cycle capability virtually means that a country that possesses this capability is able to produce nuclear weapons. Rouhani’s goal is clear. Furthermore, the “Supreme Leader” Khamenei is the true decision maker regarding Iran’s nuclear program. Khamenei has not given any indication whatsoever that he has changed his objective of attaining nuclear weapons. Iran claims that it supposedly has the “right to enrich.” But a country that regularly deceives the international community, that violates UN Security Council resolutions, that participates in the slaughter of civilians in Syria and that promotes terror worldwide, has no such right. Israel does not oppose Iran having a peaceful nuclear energy program. But as has been demonstrated in many countries, from Canada to Indonesia, peaceful programs do not require uranium enrichment or plutonium production. Iran’s nuclear weapons program does. Israel calls upon the international community not to reach a partial agreement that would fail to bring about the full dismantling of the Iranian military nuclear program, and at the same time, could lead to the collapse of the sanctions regime. Iran believes it can get by with cosmetic concessions that would not significantly impede its path to developing nuclear weapons, concessions that could be reversed in weeks. In exchange, Iran demands an easing of the sanctions, which have taken years to put in place. The international community must reject Iran’s attempts to reach a deal that leaves it with the capability to develop nuclear weapons and must insist upon a genuine and sustainable agreement.